The ACT Government has announced an assistance package for the ACT’s rural landholders as a result of the current dry conditions. This follows on from work we’ve done with farmers in recent years to build their resilience for dealing with the increasing likelihood of dry conditions due to climate change. The package is designed to support those farmers in need and also further prepare them for the future. seek rebates for stock water infrastructure purchased/paid for after 30 June 2018.
any costs or labour that are excessive or superfluous to requirements. 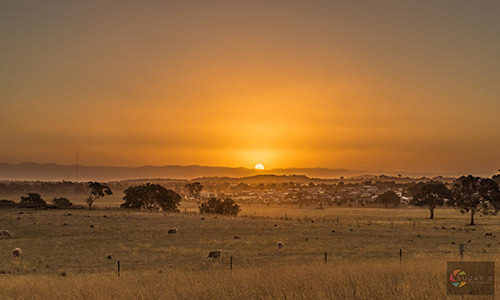 The ACT Government will be responsible for determining if an expenditure by an ACT rural landholder meets the criteria for scheme within the ACT. You can also contact the Regional NRM Facilitator Anna Van Dugteren on 6205 2914 or email Anna.VanDugteren@act.gov.au to discuss further if projects would be eligible for rebate. A new grant program totalling up to $150,000 for 2018-19 is supporting rural landholders across the ACT to implement drought resilience activities on farm. Seventeen projects will support landholders to improve their stock water (water to keep sheep, cattle and other farm animals alive) through constructing or de-silting dams, installing bores and tanks, installing pipes and troughs to extend water into areas where dams have dried up, and accessing off-stream water through construction of pumps, pipes and troughs. A further seven projects will assist landholders to construct fodder conservation infrastructure such as silos and hay sheds. These projects will enable landholders to buy or grow their own stock fodder such as oats or lucerne and store this fodder and protect from the elements until they need to feed it out to their stock, taking the pressure off their soils and pastures. Most of landholders are also planning to use the fodder storing sheds to harvest rainfall for stock water purposes. Two projects will assist landholders to install fencing to manage kangaroo numbers on their properties and reduce the total grazing pressure on their farm – thus protecting soils and pastures particularly during these dry times. View the 26 projects supported under the ACT Rural Resilience Grants in 2018-19. This program follows on from the ACT Rural Grants which ran from 2013 to 2018 and helped farmers achieve sustainable agriculture outcomes. The ACT Government is endeavoring to locate areas that may be used for relief grazing for a short period of time. There is currently a block in Hume identified. If you are interested in potentially accessing this relief grazing please contact the Rural Services team on 6207 3587 or email act.ruralservices@act.gov.au. A transport subsidy scheme has been introduced in line with the NSW Government’s model. This will provide a subsidy of up to $20,000 on transport of fodder and/or water to a property as well as the movement of stock during the 2018-19 financial year. Payments of up to 50% of freight costs (capped at $20,000) can be made on eligible, paid tax receipts which demonstrate transport occurring between 1 July 2018 to 30 June 2019. The ACT Government have updated the eligibility criteria in line with recent changes to the NSW Government drought assistance strategy. Previously, owners and operators of the business were not eligible if they did have gross off-farm assets exceeding $1,000,000 (excluding funds in a registered superannuation fund). This amount has been increased to $5,000,000. Application guidelines and claim form are now available as PDF and Word. Applicants also need to complete the relevant transport record. Would you like help putting together an application? If you are interested and would like to discuss a potential application please contact Warren Schofield on 6207 8480 or email act.ruralservices@act.gov.au. Farmers are reminded of their biosecurity obligations when purchasing and transporting fodder. These requirements are designed to minimise the impact and risk of pests and weeds. The Australian Government provides a variety of assistance programs to farmers. On 5 August 2018, the Australian Government expanded eligibility for the Farm Household Allowance by raising the cap on total farm net assets from $2.6 million to $5 million and announced additional assistance to farmers receiving Farm Household Allowance via two lump sum supplementary payments of up to $6000 on 1 September 2018 and 1 March 2019.